Last night, I was planning on making udon noodle soup when I returned home from work. As the workday was coming to an end, however, I realized that I had forgotten to prepare the vegan dashi (the soup base) in the morning. Darn. Can't make udon noodle soup without the dashi. 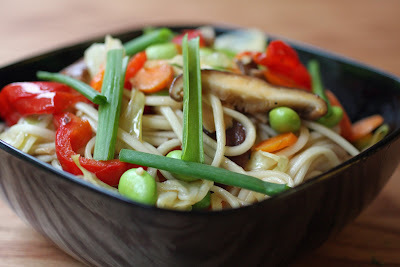 Driving home from work that day, I decided to stop by the grocery store to pick up a head of cabbage, a red bell pepper, and some shiitake mushrooms (my new favorite ingredient), so that I could make a simple vegetable stir fry with udon noodles. A healthy (vegan) and delicious dinner was on the table in about 15 minutes from the moment I walked through my front door. Bring a pot of water to a boil and cook the udon noodles according to the directions on the package. 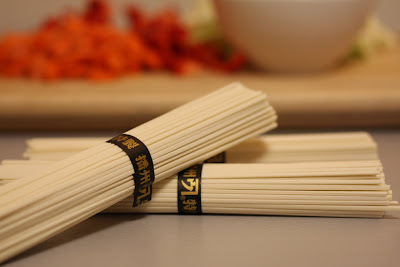 When the noodles are done cooking, drain them, rinse them thoroughly under cold water, and set them aside. Heat the canola oil in a large skillet over medium-high heat. 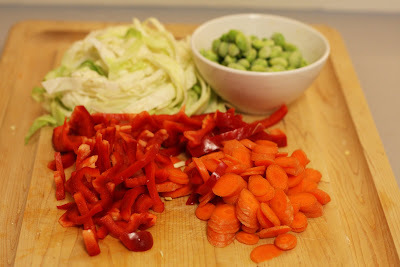 Add the cabbage, mushrooms, bell peppers, carrots, edamame, garlic, and ginger. Saute the vegetables until they become crisp tender, about 5 minutes. Stir in the vegetable broth, soy sauce, and sesame chili oil. Continue cooking for another minute or so. Toss the udon noodles in the skillet until they are warmed through. Garnish with the green onions and serve. Caught this site after looking for a review of the john prine/steve earle concert last hs. This was again for me, another great peformance by john prine, as i believe this was my 3rd time. I thought that steve earle's acoustic solo sound was further enhanced by the Filenes's warm setting and structure. However, the crowd in the seats seemed rather subdued in my section. if you have not seen chris isaak,(one of the best perfomers i have ever seen),please go and witness this fantastic singer, actor, and entertainer, you will not be disapponted. It will be my 3rd time there in july for his appearance. I love wolftrap. Ok, then i started looking at the recipes and cannot wait to try some of them. i will also forward this to my daughter who works on the hill and loves to cook. Also, if you are not familiar with mountain stage, please try it on WV NPR. Steve Earle will be playing on 6-7-09, not sure if it is now taped or live, used to be live at 3pm on most public radio stations, used to love to attend, and have seen and listened to many memorable shows. thanks, and this caught my eye and drew me in, will save and be back to try the recipes. TAMMY, RN and FIELD NURSE REVIEWER FOR WEST VA MEDICAL INSTITUTE AND I LIVE IN MARTINSBURG, WV. Cheers Paul. I particularly like the Sora Shima track. I'm a big fan of that kind of thing - Jakob, HDU's 'Tunguska' etc. You should check out the older Sora Shima E.P.s I mention in the blog too. Funny Story from the Blogosphere . . . .